Baked teriyaki salmon with garlicky broccoli on a bed of rice, a delicious Japanese recipe for two that is healthy and nutritious. 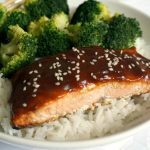 The homemade teriyaki sauce is way better than any store-bought sauce, and it gives the salmon a delightful Asian touch. If one of your New Year’s Resolutions is a healthier you, then I am sure you’ll want to start charging your eating habits a little bit. I myself am planning to stay away from desserts or as long as I can possible stay. Not easy, of course, but worth a try. It hasn’t been just December where I feel I had a bit too much of the sweet stuff, but it’s been a while now. I like to joke that it is the sugar that keeps me going through the day, and pretty much keeps me sane when sleep deprivation is a norm with a theeting baby, and a forever energetic toddler. But I guess I need to ditch the sugar, and try to go back to healthy eating, if I want to keep nice and fit. I’ve been debating whether I should also join the gym, but that would be too much I guess. I have never been a gym girl, and can’t possible make the extra effort. So healthy eating it is! Now, this teriyaki salmon is absolutely fantatic. Super flavourful, light, nutrition, and ready in about 20 minutes. This is what I call a proper meal! What is the secret ingredient here? 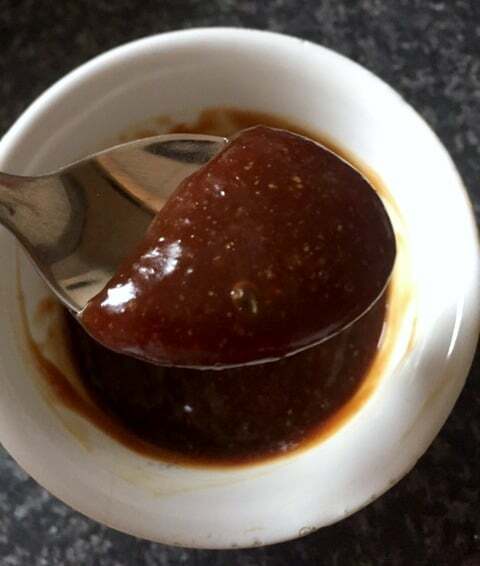 The homemade teriyaki sauce. I have long realised that buying sauces for Asian recipes is a big mistake. Making them at home is totally effortless, and they tastes tons better. And I bet they are healthier too. 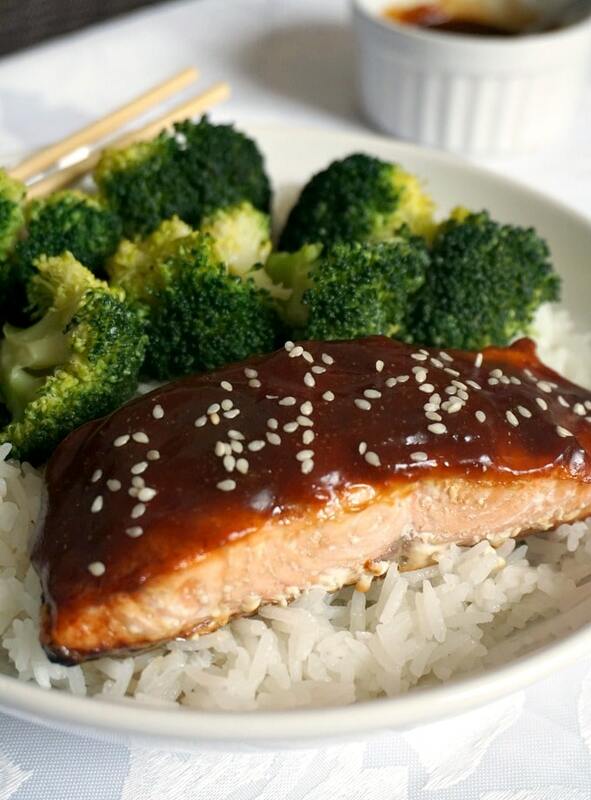 The homemade teriyaki sauce hardly takes 2-3 minutes to make, and it gives the salmon a heavely flavour. You might think that buying hte ingredients separately could cost a lot more than buying the ready-made stuff. Well, not if you use the ingredients a lot. I cook Asian recipes pretty often, so for me it’s definitely worth having them in the kitchen. From Healthy Chinese Chicken Egg Fried Rice Recipe, to Grilled Teriyaki Chicken, Japanese Udon Noodle Soup, or Chicken Satay Skewers With Crunchy Peanut Butter Sauce, these are a few of the recipes I make over and over again, and never have enough of. Light soy sauce, dark soy sauce, sesame oil, honey and rice vinegar are a must for this teriyaki sauce. The cornflour will make it thicken and coat the cooked salmon beautifully. It is ually the fresh garlic and ginger that are used to boost the flavour, but if you use the powedered ones, that should not be a problem at all. After all, homemade stuff can be made your own. I find that the sauce is strong enough, so the salmon doesn’t require any marinating. I just drizzled some sauce over the salmon before I thicken it, and coat it with the thickened sauce once it is out of the oven. 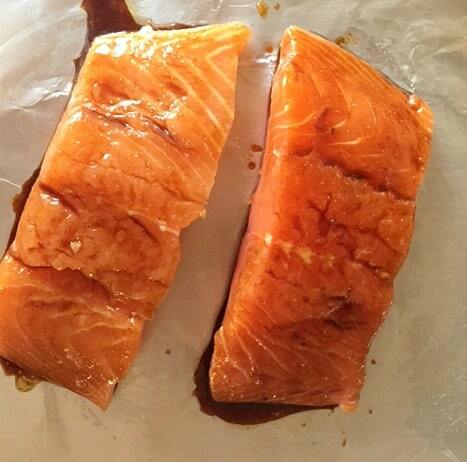 Depending on the size of your salmon fillets, it shouldn’t need more than 15-20 minutes in the oven. Salmon usually cooks quickly, and it becomes nice and flakey. With Valetine’s Day just over a month to go, this recipe can make a delicious romantic meal for too. 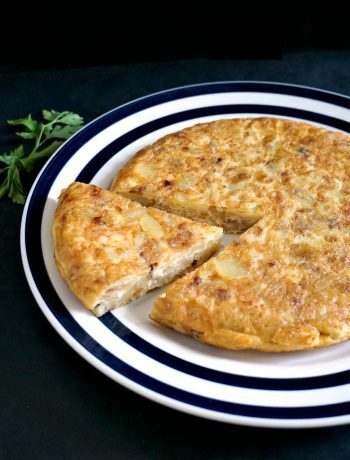 It is posh, very tasty, and you need not slave away in the kitchen. 20 minutes including the prep time, that’s really easy, it surely takes longer to wait for a not-so-romantic take-away. It might have been an one-off event, but even my husband had the salmon today, and he is usually a salmon hater. That really says how nice this recipe is. If you’ve liked my BAKED TERIYAKI SALMON or any other recipe on the blog then don’t forget to rate the recipe and let me know how you got on in the comments below, I love hearing from you! You can also FOLLOW ME on FACEBOOK, and PINTEREST to see more delicious food and what I’m getting up to. Baked teriyaki salmon with garlicky broccoli on a bed of rice, a delicious Japanese recipe for two that is healthy and nutritious. The homemade teriaky sauce is way better than any store-bought sauce, and it gives the salmon a delightful Asian touch. 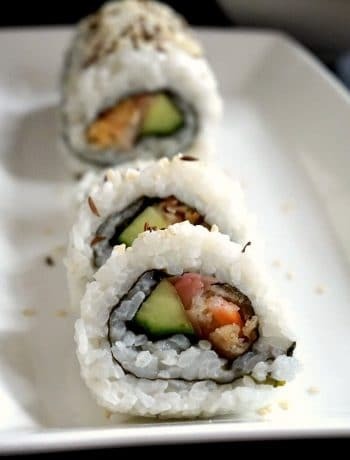 To make the sauce, combine the light soy sauce, dark soy sauce, sesame oil, rice vinegar, honey and garlic and ginger powder in a bowl. Arrange the salmon fillets on a baking tray that has been lined with kitchen foil and greased, then drizzle some of the sauce over. Bake for about 15 minutes or until cooked though. Combine the cornflour with 4 tablespoons of cold water, mix well, then add it to the teriyaki sauce. On a low heat, stir the sauce for about 2-3 minutes until it thickens, then remove from the heat and set aside. 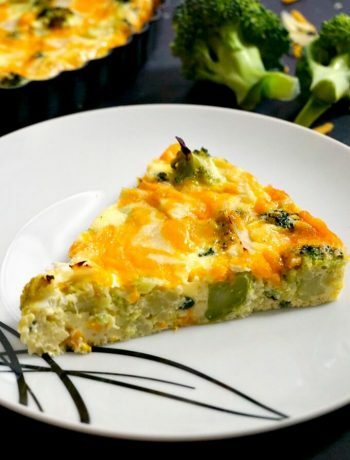 Break the broccoli head into florets, add them to a pan together with the chopped garlic and about a quarter of a cup of water, place the lid on, and cook for about 5 minutes until tender. Rinse the rice well with cold water, then add it to a pan together with a cup of cold water. Cook on a low heat with the lid on until all the water has been absorbed and the rice is cooked through. 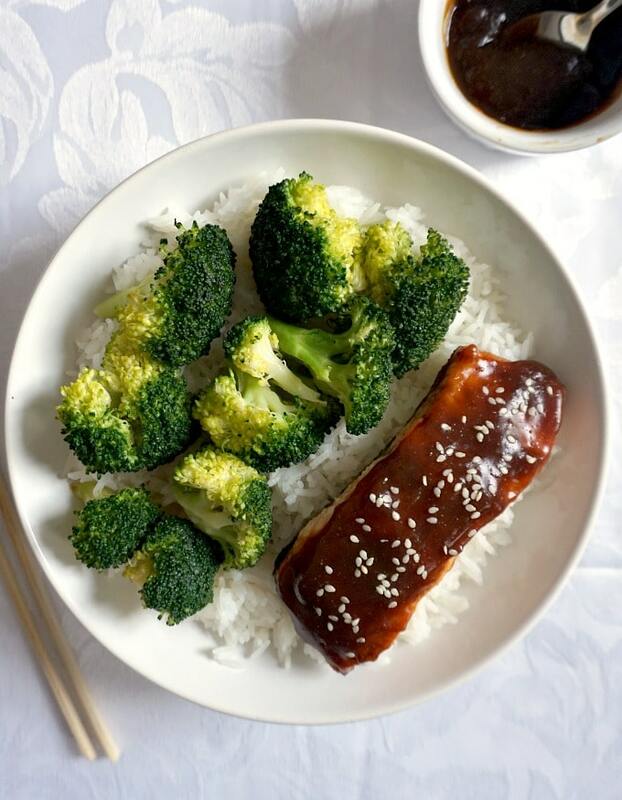 Once the salmon fillets are baked, coat them with the thickened teriyaki sauce, and serve with sesame seeds if you wish, and with the broccoli on a bed of rice. I am really confused. I’m new to cooking and I thought this sounded easy…but you say that rice vinegar and sesame oil are a must for the homemade sauce. However they are never listed in the instructions. Hi Caira, thank you for your comment. Silly me, l forgot to add them to the instructions, sorry for that. I have just edited the recipe to reflect the channge. They should have been included with the other ingredients at the beginning when the sauce was made. I hope this clears the confusion.